The Village Crone, designed by Anne-Marie De Witt and published by Fireside Games, is a thematic worker placement game where players take on the roles of witches, all competing to be named the Village Crone. It is a game that, at first glance might promise to be a light, quick bit of magical mischief, as you send your familiars scurrying around town to steal ingredients, deliver spells, and harass the hell out of the villagers. However, The Village Crone is a game that can’t quite decide what it is or who it’s for. The Village Crone plays anywhere from 1-6 witches and has an estimated playtime of about 90 minutes. We have some choice thoughts on both that player count and the playtime, but more on that in a bit. The board is composed of 6 large tiles and can be arranged in any orientation or order that lines up at least part of the grid. 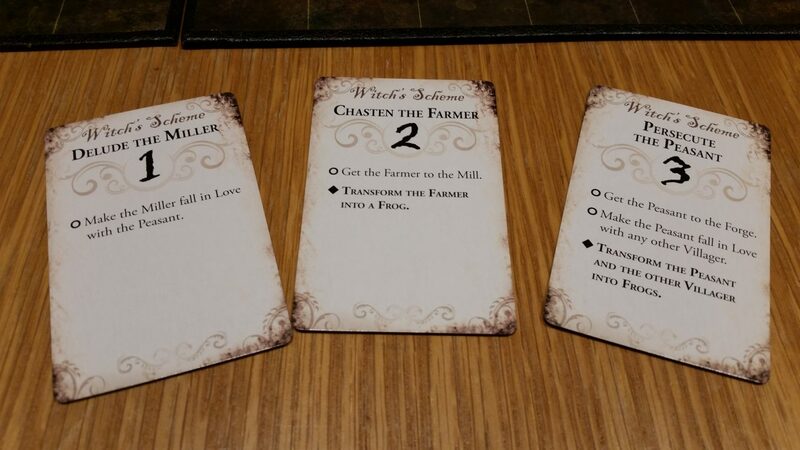 The witches will start with several familiars in play scattered about the village, which allow them to gather the resource associated with that location. The witches themselves aren’t represented on the board, as their power can be enacted anywhere within the village. On each round, witches will gather ingredients and cast spells, all while trying to be the first to fulfill 13 points worth of Witches’ Schemes, and therefor be crowned the Crone. Rob: Do witches actually crown each other? Like, are we actually participating in some sort of pageant? Andrew: You know what? I have absolutely no idea. It’s a solid question. The village tiles are big; big enough that we felt like they looked a little empty (some background art or landscape features would have livened up the place a lot). And depending on how the tiles are arranged, moving around on them can vary anywhere from painless to agonizing, with large empty patches contributing nothing but wasted time. Jess: Though, to be fair, you’re a witch! Walking your minions from one place to another isn’t the most efficient way your schemes can be enacted! Technically, the board could be set up however you wanted, like so. But why would you do this to yourself? Each Witch’s Scheme has requirements, either passive (as in, they just have to be true, like a villager being in a specific location), active (which require that you cast a specified spell on a specific target), or a combination of both, depending on whether the scheme is worth 1, 2, or 3 points. 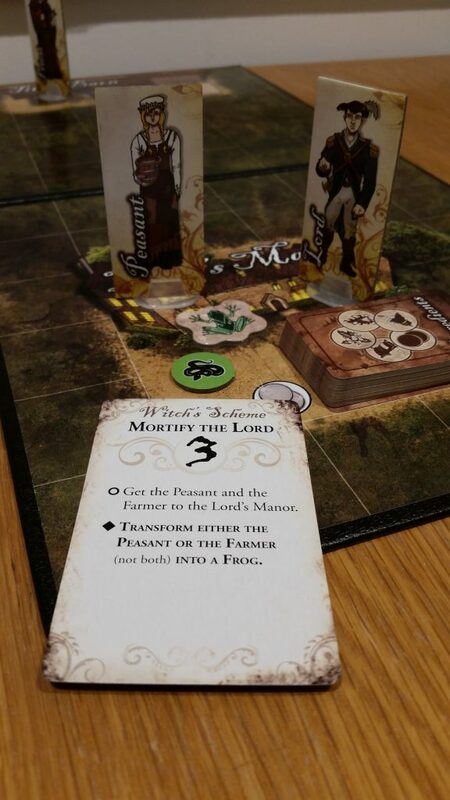 Each witch is given one scheme of each value at the start of the game. As soon as the board conditions for your scheme are met on your turn, you can score your scheme and draw fresh ones. You can also spend a silver to score a scheme out-of-turn, letting you take advantage of board conditions created by other players. Every witch has access to the same book of spells, which they will use to mess with villagers and try to complete their schemes. These spells all require 2 ingredients to cast and are well-described by the player aid each witch receives. With 2 fire and a clever rhyme, these two villagers must now pick a china pattern! Andrew: Spells are absolutely the heart of The Village Crone…though I don’t recall ‘heart’ being an ingredient. Maybe for an expansion pack. Jess: Each spell has a clever little incantation you have to say as you cast it…which got pretty old about 4 castings in. I mean, it’s a neat bit of theme, but it gets tiring to hear the same little rhyming couplet over and over. Rob: Especially since if you don’t incant and someone calls you out, you actually lose the spell! That’s awful! Andrew: However, things did get a lot more fun when we realized that you don’t need to say that specific incantation, just an incantation; play definitely got sillier once we started coming up with our own incantations for each spellcasting. Jess: It also got a lot less safe for work, but maybe that’s to be expected. 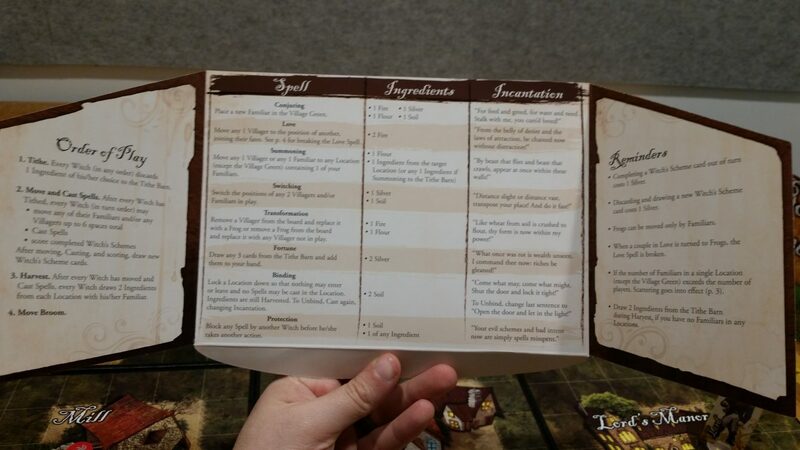 After every witch has had a chance to move and cast spells, each player collects 2 ingredients from the locations where they have familiars (your familiars are essentially your workers). 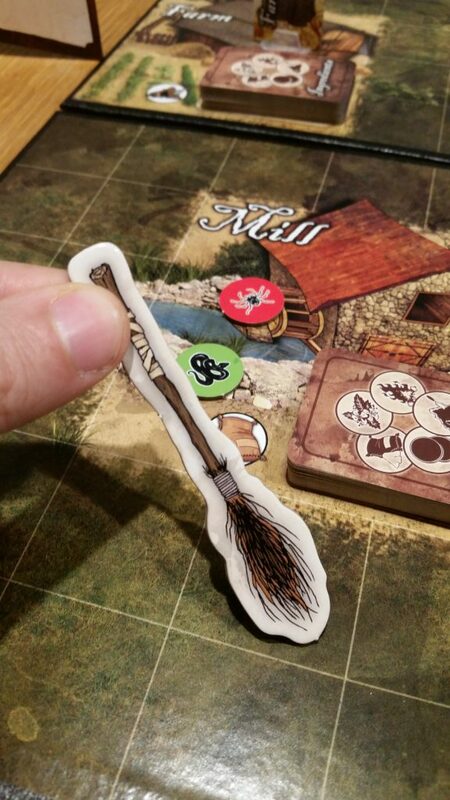 Once done, the first player broom (sadly not life-sized) passes to the next witch and the game continues until someone accrues 13 points worth of scored schemes. That player triggers the final round, after which the Crone is declared. Jess: So, the first time we played The Village Crone, we had 4 players. 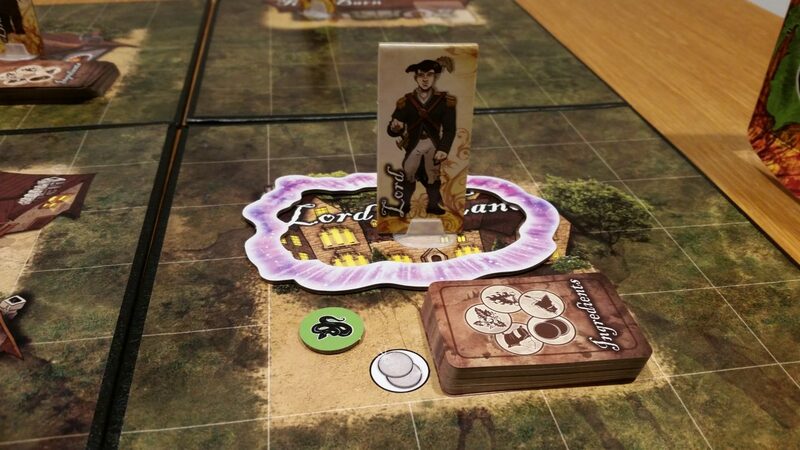 The game felt long and honestly a bit difficult – all the schemes involve getting conditions exactly right, and it is just so easy for another player to undo something you have been working for two turns to set up, even unintentionally; it was pretty frustrating. Diana: Yeah, there was a lot of chaos in the 4-5 player game, and not in a particularly fun way. No one likes having their carefully-laid plans overturned, and the frequency with which it happened really didn’t work for me. Add to that the fact that each time a player completed a scheme they had to take at least a minute reading 3 new scheme cards to pick their replacement, and the game just didn’t flow well. Andrew: Agreed on all points. And yet, there was something about it that made me think that there was still a good experience to be had in there. The bits are neat, the spells are neat, the concept is neat, but somehow, it just didn’t quite add up. What really left an impression on me about The Village Crone was the fact that, unlike many other games in my collection, it actually was heavier on its theme than its gameplay; that made it a unique anomaly in a world of pasted-on themes, and also made it hard for me to dismiss. To summarize quickly, The Village Crone has some really good things going for it: it is thematic and mechanically straightforward, appealingly designed (for the most part), and has a solid core gameplay concept. But it its detriment, our playthroughs suffered from prolonged periods of downtime and from the game’s frustrating tendency to have many people striving for contrary goals, only one of which can ever be satisfied at any given time. Even without players intentionally messing with each other, there was too much chaos at the table and too little feeling of planning or agency, especially for someone working toward the more complex 3-point schemes. The Lord, now trapped in his own manor, will be horrified to learn that Netflix cannot penetrate an arcane barrier! AHAHAHA!!! I’m a witch. Aha! I’ve invited smelly commoners to your manor and turned one into a frog! Take that! Additionally, the thematic elements didn’t quite add up to the same ‘player type’ as the mechanics demanded. While no particular piece of the game was complicated, keeping several schemes planned out and running simultaneously was much more challenging than its goofy, playful theme suggested it would be. The box suggests a minimum player age of 13, which sounds about right, but even still, we were left wondering, just who the heck is The Village Crone for, anyway? My answer, it turns out, has as much to do with who it isn’t for than anything else. The Village Crone isn’t good for big groups, despite its ‘1-6’ player count. Past 3 players, the game is somehow both grinding and chaotic, with no player able to really plan ahead in any meaningful way despite the increased downtime. It also isn’t for strategists, despite the fact that you need to strategize to make any given scheme work. But it also isn’t just a kid’s filler game; tracking schemes and ingredients is just a touch too complex and there is just a little too much take-that potential to fill that role, either. However, none of this is to say it isn’t for anyone. The Village Crone plays absolutely best between 2 and 3 players, but they have to be the right players. Those players have to be ready for a playful, somewhat chaotic good time, though the lower player count makes a huge improvement to the experience of trying to plan ahead. And above all, they must absolutely be willing to invest in the game; not time, not consideration, but fun. Name your mice. Make up silly incantations as you screw around with the peasants. Describe how your spider familiar steals a whole sack of flour from the Mill. Come up with embarrassing gossip about the villagers as you plague them with all manner of inconveniences because, at the end of the day, the fun you’ll have with The Village Crone is directly proportional to the fun you’re willing to put into it. 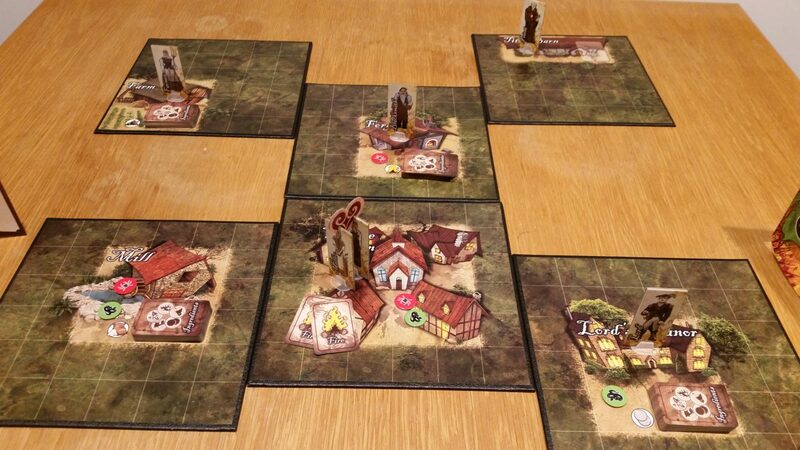 Andrew: Is The Village Crone a great game? No, it’s not, and I’m sorry to say that. Not just because I like several of Fireside Games’ other titles, like Bears! and Castle Panic, but because there are so few games I have played that embrace their theme so wholeheartedly, something I truly adore as a player. De Witt’s concept is sound and the production is high-quality. But the gameplay doesn’t quite deliver on its promise. I wanted to love The Village Crone, but I didn’t. But I wouldn’t call it a bad game, either. With the right group (both in size and composition), there is probably some fun to be had with it, especially if the theme really speaks to you. A patient parent with a clever kid or two might have a lot of fun with it, as may couples who dig the theme despite the take-that potential and somewhat chaotic gameplay. Otherwise, and despite the obvious care that went into the game’s concept and design, The Village Crone probably isn’t the game for you. 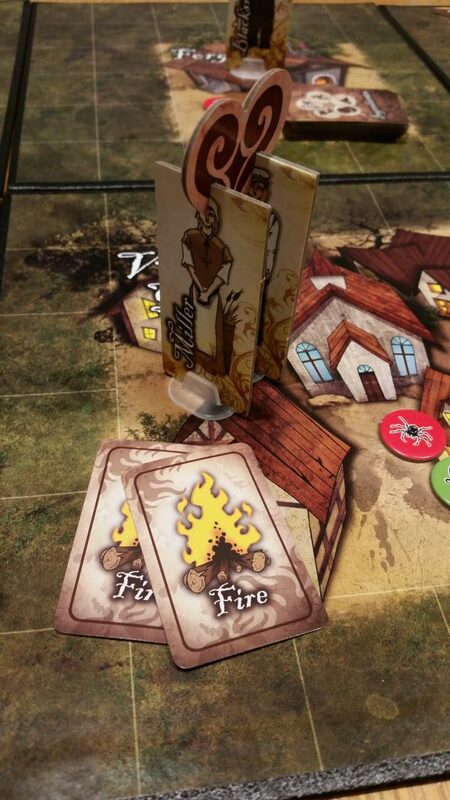 We strongly suggest watching Fireside Games’ excellently-made how-to-play videos to get a better sense of how the game works and if the theme would appeal to you and your group. 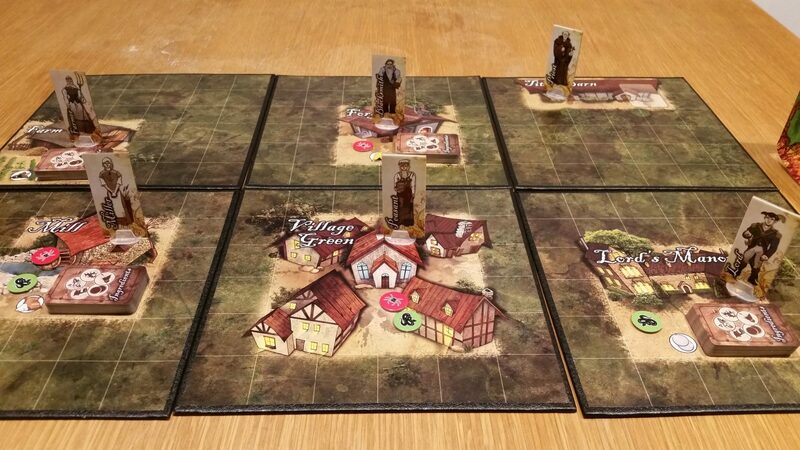 Rob: And for you solitaire players, I also did a full write-up of The Village Crone as a single-player game. Check it out here. A really well-designed player aid is necessary for a game like this.